Fortuitous timing is what springs to mind. Having been fortunate enough to work thru to an Advanced Test pass at the beginning of July, barely 3 weeks later into the classroom to begin the next part of the IAM journey. Many thanks to Geoff James for his time and effort to help me get to this point in swift order! 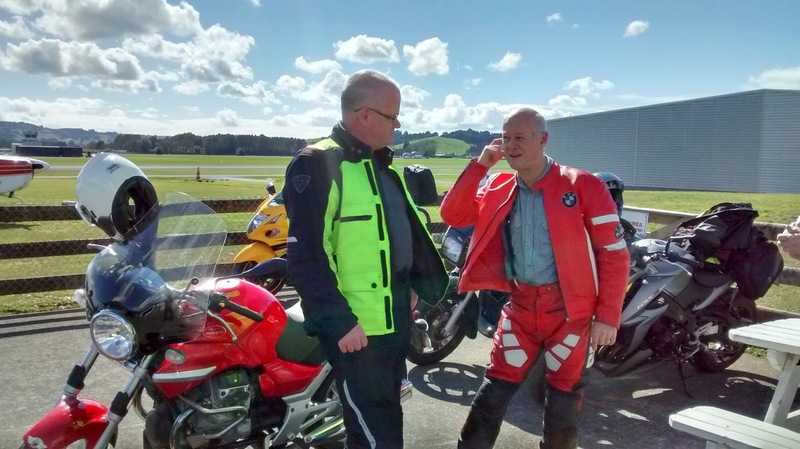 Having adopted the riding standard has brought new enjoyment to my riding, most of you who have gone down this route will no doubt have similar experiences. What the Observer course is now doing for me personally, is making that step which was for me the motivation for joining IAM in the first place; helping others improve their riding. Quite an eye opener for me how much "fine-tuning" my own riding needed first though (insert face palm emoticon here). As I'm finishing off this dear diary entry a few weeks after the classroom work, I'll admit I've been pondering how to encompass the past few weeks. The transition from being merely a pupil of the IAM approach to now being both pupil and proponent of same seems daunting. As I do some coaching of truck drivers in my line of work, lots of similarities come to the fore, yet initially I found myself getting hung up on the differences between mentoring in my work life and the IAM. This was after the first day in the classroom, when I thought about it some more that night, loads of similarities in reality. If anything, the IAM approach to mentoring can be applied to my work environment with ease, and would likely be received better than some of our present training methods. So what is the role of an Observer within the IAM? This was one of the questions posed by Philip McDaid, our esteemed Chief Examiner. The simple answer is to take an Associate to Advanced Test level of course. The long version, well known to those of us who have passed our Advanced Test, is not always that simple. It varies from person to person naturally, yet I can see how applying the riding standard to an individual, then building him/her up in steps by improving the areas that need it...and before long an Associate should be heading in the right direction. Plenty of amusing ways to recall the basic process of getting to know a new Associate and gathering the requisite info to form a plan, or as Barry Holland put it, a casual interrogation while putting him/her at ease. On paper this can seem daunting, but it doesn't have to be. Start with a common interest, motorcycles we've owned for example, ask some questions and let the Associate do most of the talking. Accentuate and praise the good stuff and view the negative stuff as improvement opportunities. Sounds fluffy at first doesn't it? This was the teaching element on the course that had me grinning the most, for it just once again reminded me of the flow of positivity that I'd received from my Observer along the way. Yes there were things I could do better, but that drill sergeant style that some of us may be accustomed to from our boy scout days, it just wasn't there. Does it matter though? Well that would vary from person to person, and I'd agree with the sentiment expressed by Richard Turnbull (Akld Observer) in that I'd just want the stuff I need to do better on. Others will obviously need a more delicate approach, but I can't argue that as a starting point leaving a very positive focus on the good stuff and putting a positive spin on the improvement opportunities, can only serve to build up an Associate. The observed ride report. Well it seems daunting at first. Looking at it in the classroom I was more or less slapped in the face with the realisation that I'd been focused on the stuff I needed to do better on. So when doing the dummy exercise with Sheldon (aka Alan Denness) after a brief ride, offering praise and criticism, trying to fill in the ride report and keeping a positive approach to it all...guess what? Oh so hard!! The prank Alan pulled on me both amused and unsettled me briefly. The joys of being a newbie I suppose. So looking at the ride report and trying to touch on every single aspect during a debrief, not gonna happen. At least not while trying to stay positive. An approach for remembering the main positives and negatives for a debrief was shared by Peter Hookham (Wgtn Observer) in the 3 L approach (Life/Licence/Learning) and that gels with me. Can be applied in many different ways as well, during a pre-departure brief as well as mid or post ride chat. In reality, if an Associate did nothing to harm life or licence the whole outing just got a lot easier I reckon. So while the Trainee Observer learning process can seem daunting at first, and reading then re-reading the manual put together, doesn't always help with quelling the anxiety...how do I feel after my first run as Trainee Observer? Take into account this was a nice easy entry, with Geoff James doing the baby sitting and taking the lead still, with me doing some parts with an Associate (Paul Quilter) who in all fairness is an accomplished rider already. Much more settled and relaxed about the process sums it up. One glaringly obvious aspect is my own positioning, the mildly overwhelming multi tasking aspect is back, new stuff going on and now staying close enough to observe yet back enough to stay safe...staggered formation at times and single file elsewhere. Remembering how we only really need to be up close a few times during a ride, settling into this routine of staggered formation in urban/motorway sections, mostly single file in country riding...practice is the key obviously. The role reversal aspect was mentioned in the course, having now experienced it first hand in an observed ride, this is the first thing I feel like I need to firm up into a nice easy routine. In wrapping up this entry, let me just share a renewed admiration for Geoff and the many other Observers who have mastered this set of skills and make observing look easy. Great post Rob..... you're sort of poacher turned gamekeeper now! A perceptive piece of writing and the fun of looking forward to acquiring a whole bunch of new skills. Had to grin about the multi-tasking aspect raising its head again. My problem when going through Observer training was remembering all the positive stuff and improvement areas I'd noticed so that I could bring them up at the debriefs! It does get a lot easier with practice though!